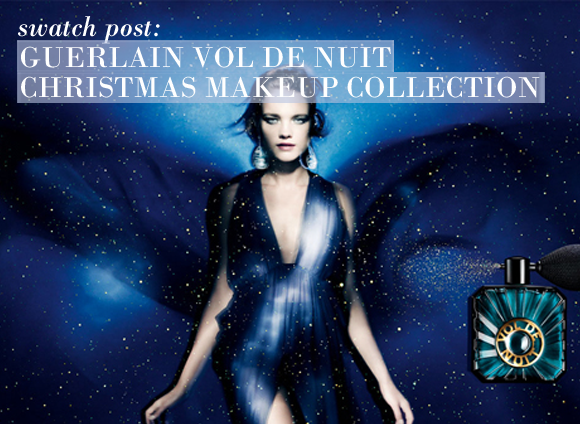 It’s almost a month ago now that I first discussed the launch of the new Guerlain Belle de Nuit Christmas collection, but I’m sure no one will complain if I revisit the beautiful range once again for a special swatch post! I managed to get my hands on the range this week and went a little swatch crazy (my clothes are saturated with Vol de Nuit glitter). The collection is inspired by the changing colours of the night sky, so expect to find a lot of shimmer and dazzling blues right here…. This pressed powder took me completely by surprise. I expected a somewhat translucent powder with a bit of shimmer, but what I got was so much more than that. A light dusting of this all over the face corrects colour and illuminates the complexion, and the slightly pink tone works well as a subtle blusher, too. That gorgeous peacock pattern isn’t just an overlay – it is exactly the same all the way down, so you always get the same effect. My top tip is to take a small, dense brush that will pick up more product and use it as a highlighter along the top of cheekbones. This one is a showstopper – when I first clapped eyes upon this collection, it was this art deco inspired flacon that I immediately sprang for. One squeeze of the atomiser and a cloud of powder is dispersed (check out my action shot above), so that you are literally surrounded with silky soft pink-tinged powder and shimmer particles that then land gently all over. The shimmer itself is really subtle, but this can be layered with each spray. The powdery Vol de Nuit scent adds a touch of vintage style that isn’t overpowering at all. When it comes to lips, Guerlain have well and truly got glamour in the bag. 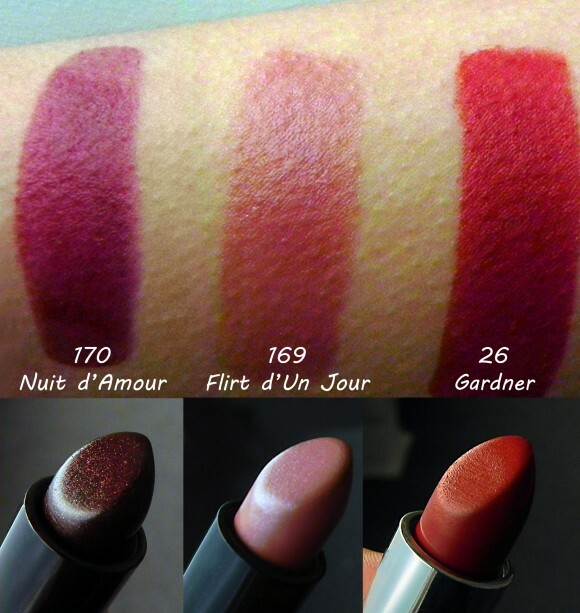 I had a lot of fun swatching these as the textures and the colour pay-off of the Rouge G and the Rouge Automatique are just so luxurious. The above swatches were created straight from the bullet, and took a couple of swipes – please excuse my monster goosebumps, it’s so cold in this part of the country at the moment! 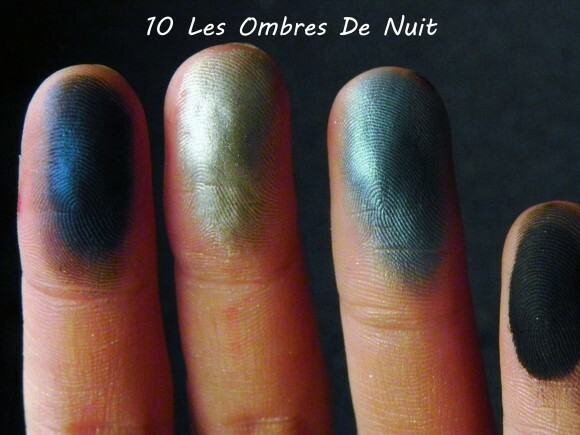 The vampy Nuit d’Amour is a little intimidating when you look at the bullet, but it’s actually a pretty manageable berry shade with golden and copper shimmer to soften the effect of the purple. A more subtle wash of colour than the swatch above is very easy to achieve, as the colour itself is quite sheer with a single swipe. Flirt d’Un Jour is a perfect daytime rosy-beige that is sheer and balm-like in texture. Of the three shades it has the most shimmer, silver and iridescent pink in this case, and this creates a flattering sheen-like effect on the lips. Gardner is a brick red shade that is ideal for the Christmas season. It’s warm and is more brown-red in some lights. It also has a very subtle micro-fine golden shimmer which breaks up the matte effect. This product had received rave reviews in several beauty columns and I went on line to try and buy it from the major retailer suggested by a magazine, only to find it was out of stock. I am glad I persevered with my search, because I found Escentual.com who had it available. It was ordered and delivered to me within 48 hours, well-packaged. It's a fabulous , luxury product, with a delicious, delicate scent and the 'sparkle' is not too over the top. I used it many times during the Christmas celebrations, and received lots of compliments! Buy some if you really want to spoil yourself. I love it and I am very impressed with Escentual.com as well ! This entry was posted on Wednesday, November 2nd, 2011 at 12:37 pm and is filed under Make-up, New products, Swatches, Tried & Tested. You can follow any responses to this entry through the RSS 2.0 feed. You can skip to the end and leave a response. Pinging is currently not allowed.